Linsey Pollak – a musician and instrument maker from Australia, returns to the Netherlands for the first time since creating the world’s largest Carrot Clarinet Orchestra for the Netherlands Clarinet Festival (Amsterdam 2016). He is in Residence during September at the Metaal Kathedraal to collaborate on the new project – “Sapstroom” (looking at communication between trees), to perform “Dangerous Song” (a musical response to the current extinction crisis, playing the sounds of endangered animals with a digital wind instrument) and to run this workshop where you make & play your own woodwind instruments and play + loop samples with a midi wind instrument and an iPad. “In our world, things often seem much more complex than they really are, and we sometimes need to strip back the layers that hide the simple principles about how things work”. Learn about designing and making woodwind instruments from paper, drinking straws, garden hose, Perspex and aluminium. Make your own “FOONKI” (a wind instrument made from a drinking straw and some garbage bag). Hear Linsey demonstrate ‘Mr Curly’ (a contra bass clarinet made from garden hose), the Cylisax a new wind instrument with a branched tube (a cylindrical bore sax) and the Flatsax (a saxophone made from plywood). Learn about live looping sounds using an iPad and a digital wind instrument. Music students, clarinet players, musicians, people who want to make their own instruments, those interested in Live Looping. Linsey Pollak is an Australian musician, instrument maker, composer, musical director and community music facilitator, touring his solo shows extensively in Europe, Nth America and Asia since 1996. 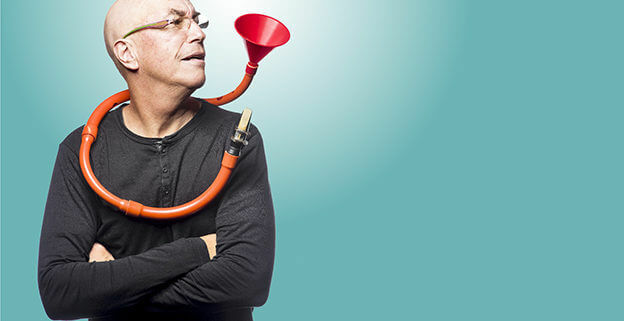 He has designed many new wind instruments with a reputation for making and playing instruments made from found objects such as rubber gloves, carrots, watering cans, chairs, brooms and garden hose. Linsey aims to de-commodify the art of music and dreams of a society that doesn’t have a word for musician, because everyone plays music (just as we don’t use the word “breather” because we all breathe). He believes that music can build a more creative society that enjoys and respects the contributions of many cultures, empowering the marginalised and bringing disparate people together. BOOK ONLINE – Limited seats. Price includes coffee, tea and all needed materials.